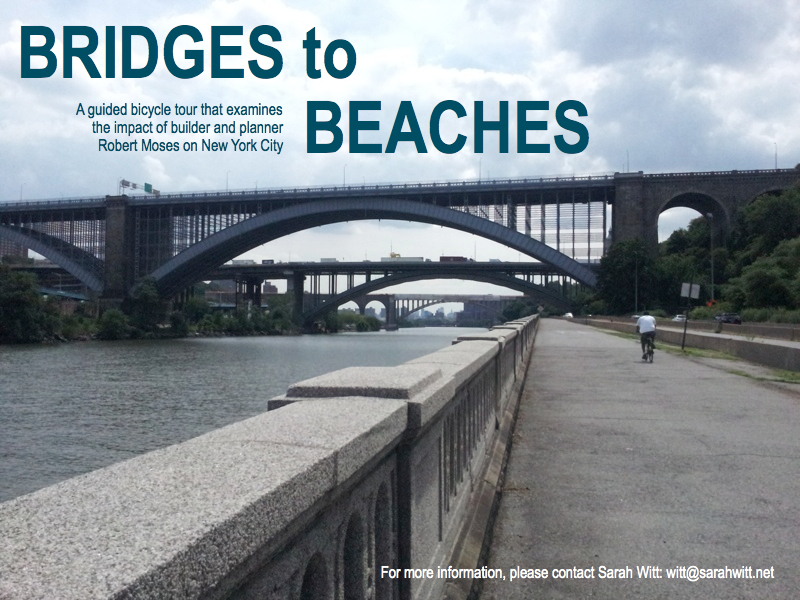 Bridges to Beaches is a bicycle tour that investigates the expansive portfolio and social impact of Robert Moses, the so-called “master builder” and urban planner of New York in the 20th century. Having completed thousands of projects in New York over the span of his 40-year career—-ranging from public parks to cultural institutions to highways—-Moses has undoubtedly carved and influenced the urban landscape we navigate today. Despite the positive aspects of his work in engineering a modern metropolis, Moses is also credited with the destruction of historical landmarks and the displacement of hundreds of thousands of people whose businesses and homes were demolished to build local expressways and interstates. The tour will visit a handful of sites developed by Moses and will unpack the controversial narrative surrounding his career. Each tour is open to 10 participants. The meeting location, rain dates and details will be disclosed in a personal email. This will be an approximately 6-hour, 30+ mile ride that will meander in and out of NYC trafﬁc. Helmets are required; helmets and bikes available upon request. About the artist: Flux Artist-in-Residence Sarah Witt is a skeptically serious and professional interdisciplinary artist working at the intersection of performance and non-performance. Sarah holds a Master of Science from Massachusetts Institute of Technology and a B.F.A from Syracuse University. During her graduate studies, she was awarded grants from the MIT Council for the Arts and the Peter de Florez Fund for Humor, the Department of Architecture Tuition Fellowship and the Schnitzer Prize in Visual Arts. Sarah has participated in residencies at the Banff Centre, Elsewhere Collaborative and Hub-Bub, and in 2009 she produced Polymorphic Plastic Parade, a nationally touring eco-art installation.